This set of gorgeous creole earrings from Evoke is crafted from sleek sterling silver. With a classic design, these elegant earrings are set with shimmering Swarovski crystal elements for a splash of sparkle. 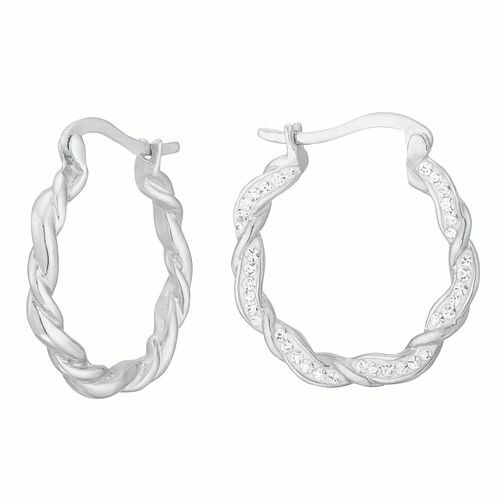 Evoke Silver Crystal Twisted Creole Earrings is rated 5.0 out of 5 by 4. Rated 5 out of 5 by Anonymous from Evoke earings I purchased these earings online and am over the moon with them. They are really lovely, a nice size and quite sparkly when the light catches them. Very efficient service and speedy delivery as always from H Samuels. I would certainly recommend them. Rated 5 out of 5 by Anonymous from Beautiful delicate earings Beautiful delicate earings ideal for short or long hair. They sparkle in almost any light and are very comfortable to wear. I would recommend them to anyone who wants silver earings with a bit of a sparkle.